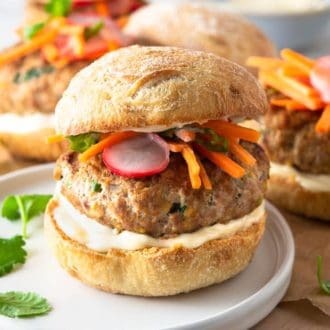 This delicious turkey burger gets a flavor-packed twist with ginger, five-spice, jalapeño, and cilantro. You won’t miss the beef but you will come back for seconds! Can you say flavor bomb? 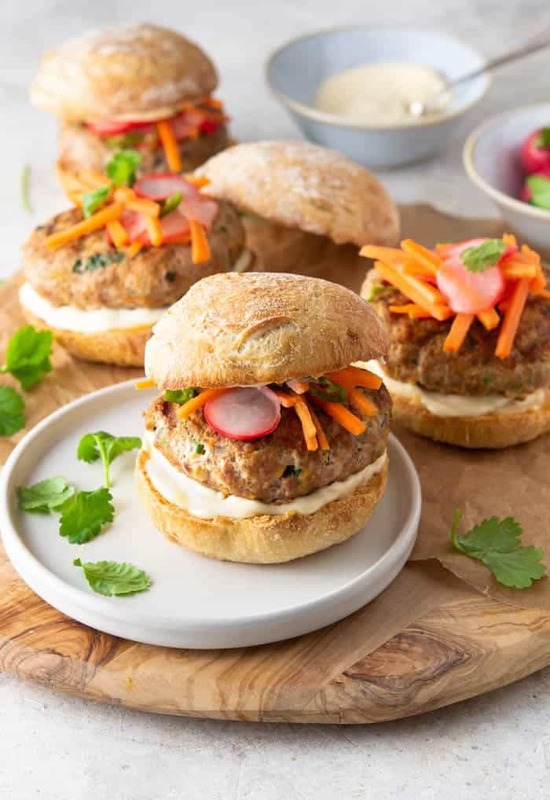 Lean ground turkey gets a whopping flavor punch from loads of fresh cilantro, chiles, and ginger, making these beef-free burgers anything but bland. Paired with a simple stir-together mayonnaise and a quick-pickled slaw that comes together in less than 10 minutes, this is a great way to level up your burger game. How do you keep turkey burgers from falling apart? Add binding agents like an egg, and breadcrumbs. Don’t add large pieces into the mix. Chop things finely. Before making the patties chill your mixture in the fridge for twenty minutes to allow the breadcrumbs and other binding agents to seep together. What goes good with turkey burgers? Are turkey burgers healthier than beef? Turkey burgers are lower in cholesterol and often have considerably less fat than beef burgers. What cheese is good on a turkey burger? How do you make turkey burgers? For the burgers; preheat the grill to medium-high heat. In a medium bowl, stir together the turkey, onion, cilantro, fresno or jalapeño, ginger, Sriracha, salt, zest, Chinese five spice, egg and panko until well combined. Form the mixture into 4 patties. Place them on a baking sheet lined with parchment paper and freeze them for 15 minutes. Spray the patties with cooking spray, carefully place them on the grill and cover while cooking. Let the patties cook through; about 5 minutes on each side, then remove them from the grill. For the smoky mayo; stir together the mayo, liquid smoke and a pinch of black pepper. Spread the mayo on the buns and top with the patties. For the spicy carrot-radish slaw; stir together the rice wine vinegar, water, salt and sugar. Microwave for 3 minutes then stir in the matchstick carrots, thinly sliced radishes and thin slices of jalapeño pepper. Let stand for 5 minutes then add to the burger. You can add additional cilantro if desired. 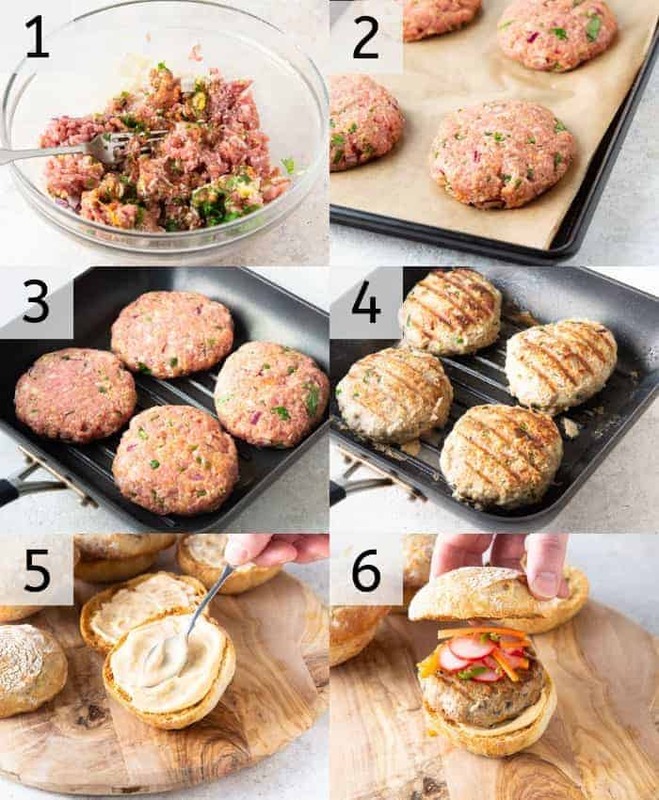 If you’ve tried these turkey burgers then don’t forget to rate the recipe and let me know how you got on in the comments below, I love hearing from you! 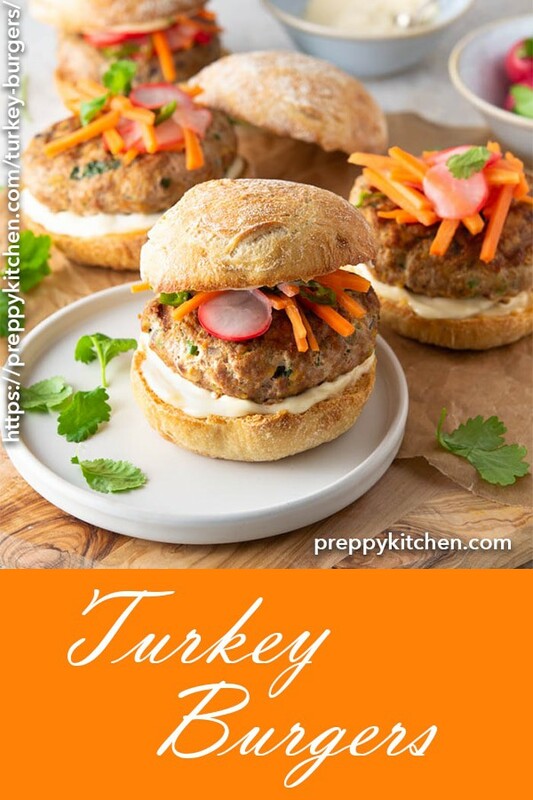 Super-tasty turkey burgers with the perfect balance of spice will become an easy to make favorite! In a medium bowl, stir together turkey, onion, cilantro, fresno or jalapeño, ginger, Sriracha, salt, zest, Chinese five spice, egg, and panko until well combined. Form mixture into 4 patties; place on a baking sheet. Freeze 15 minutes. Spray patties with cooking spray; grill, covered, until cooked through, about 5 minutes per side. 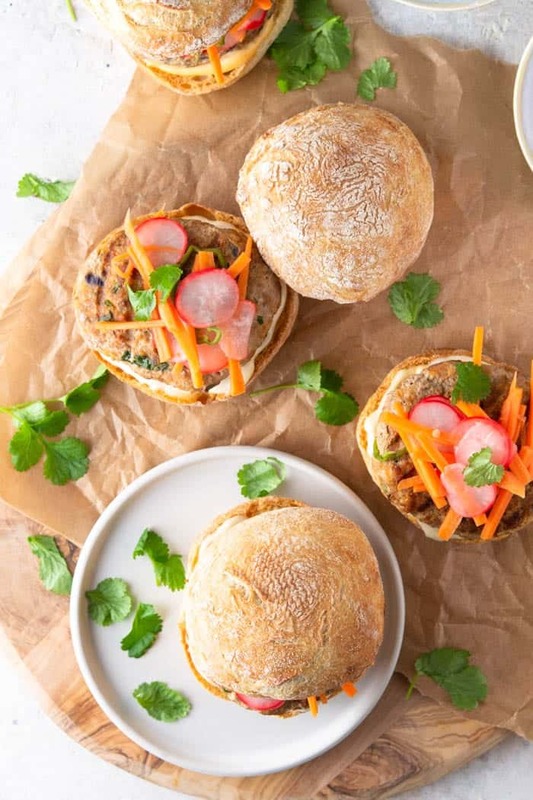 Spread Smoked Mayo on buns; top with patties, Spicy Carrot-Radish Slaw, and additional cilantro, if desired. Stir together 1 cup mayonnaise with ¼ teaspoon liquid smoke and a pinch of black pepper. Cover and refrigerate up to 1 week. In a microwave-safe bowl, stir together ½ cup rice wine vinegar, ½ cup water, 1 teaspoon salt, and ½ teaspoon sugar. Microwave 3 minutes. Stir in ½ cup matchstick carrots, 2 thinly sliced radishes, and 4 thin slices of jalapeño pepper. Let stand 5 minutes. Cover and refrigerate up to 1 week; drain before serving. These were so good! I loved the spicy Thai flavor you added! Turkey burgers are the best.